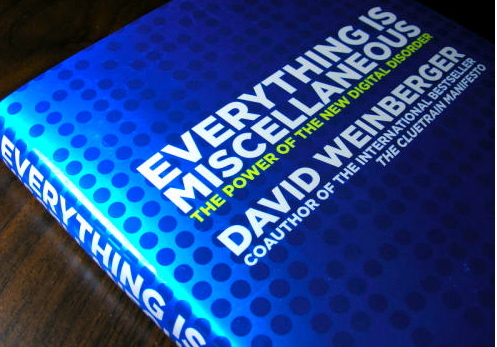 This commentary will review ‘The new order or order’ from ‘Everything is Miscellaneous: The Power of the New Digital Disorder’ by David Weinberger, 2007. In Being digital, Negroponte (1995) affirms that doubtless we are in living in the Information Age, and one of its characteristics is that ‘everything is made to order and information is extremely personalized’ (page 164). On this extent, twelve years later, Weinberger (2007) argues that people have been raised as experts at keeping their physical environment well ordered; but in the digital world the simple and unsophisticated ways of maintaining order have been already broken. We are dealing with a tsunami of data that is crashing onto the beaches (Wurman, 1996). How to deal effectively with the seeming chaos of digital information that we are deluged with? Are there new rules for organizing ideas and information? . Evidently, we are involved in a new reality where information is freed from its physical constraint. Weinberger’s (2007) central premise is about categorizing information changes wrought by current trends on the Internet. 1st Order of organization is of the physical world, manipulating physical objects and organizing them. In this respect, Weinberger (2007) argues that people posit multiple principles of organization without even thinking about it. Furthermore, they spend considerable time in making sure their world isn’t miscellaneous, because disorder is considered inefficient. Consequently, there is an obsession with defining, categorizing and organizing information as way of bringing some order to the chaotic world we live in. 2nd Order of organization is known as metadata, which is information about information. An example of metadata can be found in library card catalogs, which are usually organized and categorized by professional librarians. However, metadata is still limited by physical constraints due to its accessibility to only a handful of trained experts. Therefore, it depends on authority making things easier to find. 3rd Order of organization is refers to ‘everything is miscellaneous’. Moving from the physical to the digital, organizing information becomes freed from physical constraints and allows users to simultaneously define, categorize and organize information into a million different taxonomies without professional experts. With tools like del.icio.us, Flickr, Digg etc. everyone could break a body of information down into smaller parts, or perhaps examined from different point of view the world of information to his personal needs. Content is digitized into bits, and the information about that content consists of bits as well (Weinberger, 2007). Does miscellaneous mean that nothing needs to be categorized per-se and everything can live in a state of limbo in the miscellaneous category until we need it? Weinberger (2007) argues that the digital world allows transcending the most fundamental rule of ordering of the real world: Instead of everything having its place, it’s better if things can get assigned multiple places simultaneously. Furthermore, placing information as miscellaneous not only breaks it out of its traditional organizational categories, but also obviates the implicit authority granted. Semantically, Weinberger (2007) gives the word miscellaneous a connotation of disorder. To whatever extent, what is considered order and what is considered disorder is based upon the representative schema used. Every one has different kind of organization that may not respond to another’s organization criteria. Therefore, if we state that ‘everything is available’ rather than ‘everything is miscellaneous’ it may give an accurate meaning to Weinberger’s (2007) organizational points. Either way, using any of both, ‘everything is miscellaneous’ or ‘everything is available’ challenges the learners critical skills that have to be well developed to face the risk of finding unworthy information. It is crucial that learners have to be able to discern and self-regulate their learning, as well. Negroponte (1995) states that every technology or gift of science has a dark side; and being digital is no an exception. The digital revolution in organization goes further than to find an article or a book, it is transforming our culture, and even our identities (Turkle, 2004). In the current Information Age, should educators make much more radical change in the conditions of learning and teaching? Wurman, R. (1996). Information Architects. Zurich, Switzerland: Graphis Press Corp. (from ETEC 540/notes).